The Chattanooga, Rome, and Columbus Railroad was built to Lyerly, Summerville, and Trion in 1889. The depot was constructed at that time. The railroad was merged into the Central of Georgia system in 1901. Sometime later the first depot burned and a second depot was constructed. This depot burned May 4, 1917. The current depot was then constructed and operated as a depot until the fifties. The Chattooga County Historical Society bought the depot in 1988. It was purchased to preserve as a historic site and serve as headquarters for the Society. The depot was placed on the National Historic Register of Historical Places in 1992. In 1998 the depot was used in the television movie Mama Flora’s Children an adaptation of author Alex Haley’s of Roots fame book about another branch of his family. In 2004 the depot was used in the filming of the HBO movie Warm Springs. The mortgage on the depot was paid off in 2002. Current plans call for refurbishing the interior to approximate it appearance when in operation. Current projects are replacing the roof and constructing a handicap accessible entrance. 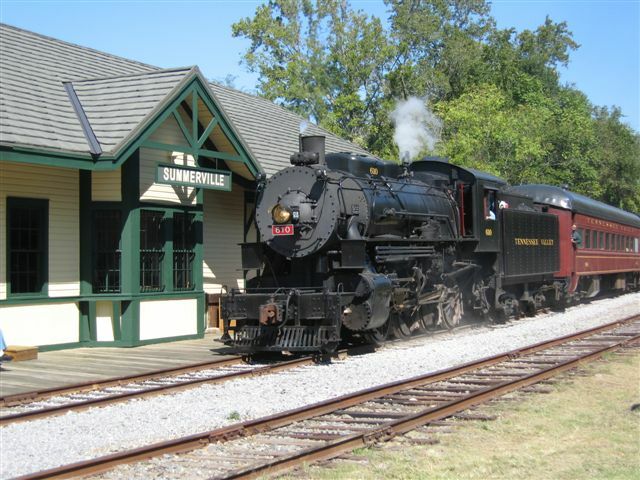 The depot is open when steam excursion trains come down from Chattanooga to use the railroad turntable in Dowdy Park.